So recently, I was again sent their Light Finish Volumizing variant, which I had wrote about it the other time and am really glad to also received another variant called Deep Cleansing Care as well as two Massage Shampoo Brushes – a common haircare tool in Japan, which I will explain more later. Shampoo and Conditioner in 200ml each and Massage Shampoo Brushes. Both variants that I have received are specially catered to combination hair. Combination hair means hair condition on the root and tip is different. In simple words, it means having more than one hair condition. For people with combination hair, they might use two shampoos to target the two problems. However, light, clarifying shampoos target oily roots may cause hair ends to be dry. Conversely, rich moisturizing shampoos target the dry ends may be too rich for the scalp, resulting in build-up that makes the scalp oily. At the end of the day, you end up compromising with only one hair issue at a time. 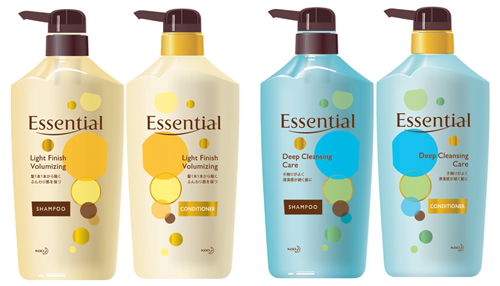 Is finding a shampoo and conditioner for your combination hair a biggest struggle? 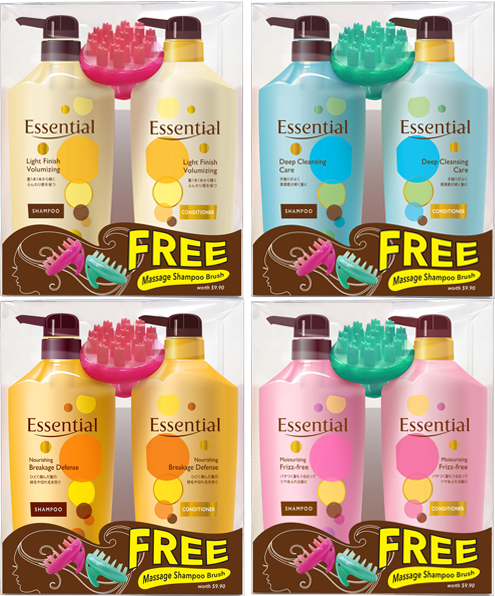 THE NEW ESSENTIAL RANGE IS YOUR PERFECT SOLUTION! With optimum combination of Smart Cuticle Care & Sebum Cleansing Technology in the Light Finish Volumizing (yellow) and Deep Cleansing Care (blue) variants, you can now achieve moisturized hair ends while maintaining a refreshed breathable scalp! They brings the best of both worlds to you! 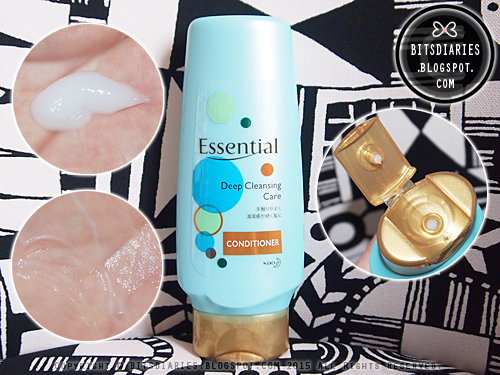 - Optimum combination of Smart Cuticle Care & Sebum Cleansing Technology for airy light roots and moisturized ends. Usage: Massage onto wet hair to lather. Rinse off completely. Suitable for daily use. For optimum results, use with Essential Deep Cleansing Care Conditioner. The shampoo is super lightweight! This is by far the most lightest shampoo I have ever tried in my life! And I like the formula very much! 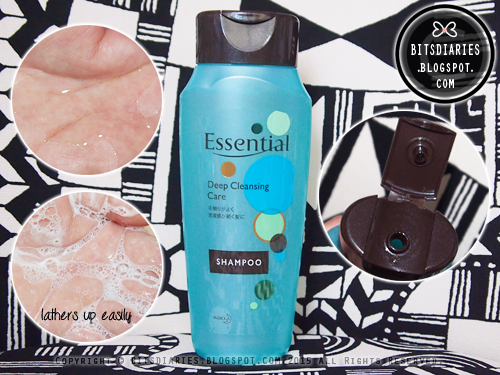 Although it is lightweight, it lathers up very easily and you don't need too much of it – a little goes a long way! And it is easy to rinse off! Usage: After shampoo, gently massage conditioner onto hair. Rinse off completely. Suitable for daily use. For optimum results, use with Deep Cleansing Care Shampoo. Paired the shampoo with the conditioner, my hair felt clean and airy-light on the scalp/roots; and moisturized on the hair ends without being too oily! 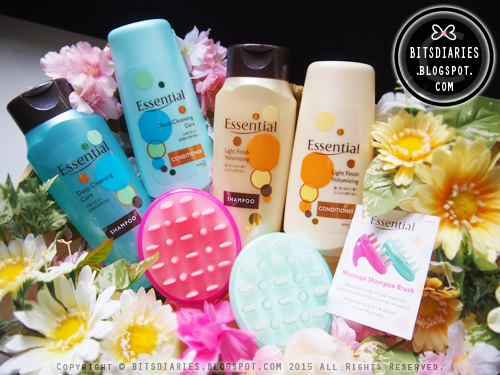 I had such an easy time combing and styling my hair after washing! In general, this Deep Cleansing Care variant cleanses thoroughly, effectively removes excess oil and impurities on the scalp/roots, maintaining a refreshed, breathable hair scalp/roots and a moisturized hair ends. It also repairs and smoothens damaged cuticles evenly from root to tip. Perfect variant for very oily, combination hair. As mentioned earlier, I was also given two Massage Shampoo Brushes. It is a common haircare tool in Japan and can be found in a substantial number of Japanese households, onsen (hot spring) facilities and beauty stores. It is used by the majority of Japanese women both young and old. With the combination of thick, round-tip and flat, fine-point bristles, it runs right through the hair, evenly spreading the shampoo and gently cleanses and removes dirt, sebum and impurities thoroughly on the scalp without scratching or damaging the scalp. It does not only help to cleanse the scalp but it also help to improve blood circulation and promote relaxation, maintaining a healthy scalp and hair growth. It is also a great tool for people who do manicure as by using the brush to wash your hair, it reduces the friction of your fingernails against the hair. Hence, it helps to prolong your manicure. By the way, the brush has a sturdy, ergonomic plastic handle and the bristles are made of flexible silicone (not too hard, not too soft). It has no pointy or sharp edges; they are round so it isn't abrasive and does not scratch the scalp. No pain at all! It comes in two colors, Hot Pink and Mint Green. 1. Wet and shampoo hair as usual. 2. Hold the brush handle between index and third finger and rub the bristles onto scalp gently from side to side with small movements. 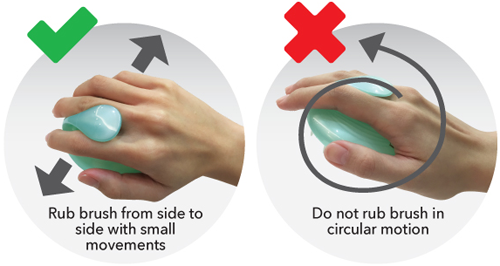 DO NOT move the brush in circular motions as this will cause tangles. 3. Rinse off shampoo and apply conditioner as per normal. The fact that you can hang it with a string is a plus! - DO NOT use when there is injury or rashes on the scalp. 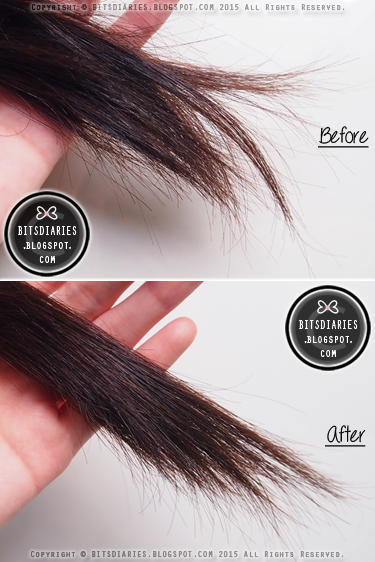 - Rub brush with an appropriate force onto the scalp which is comfortable to the user. - Rubbing with excessive force may cause injury. 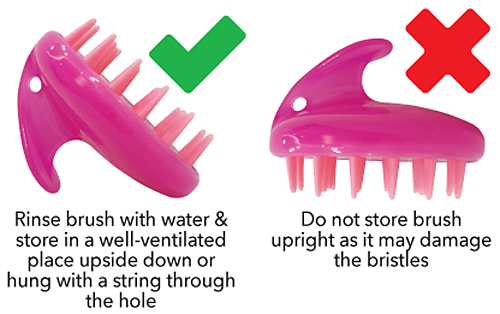 - Stop using the brush if the bristles are deformed after long usage arising from wear and tear. - In the unlikely event that mould occurs, wash brush with a shower gel and brush mould out with a disused tooth-brush. DO NOT use bleach, mould remover detergents, alcohol or hot water as these will damage the brush. After using the shampoo and conditioner, my scalp/roots felt clean and my hair surprisingly did not feel stripped. My hair felt airy light and smoother; even when brushing my hair, I found it less frizzy and no tangled at all. My hair has definitely became more manageable! 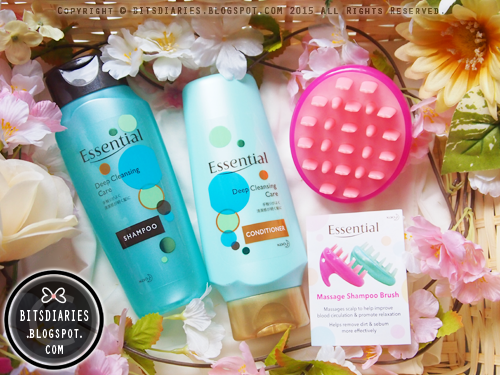 Paired with the massage shampoo brush, my scalp felt even more refreshed and breathable. 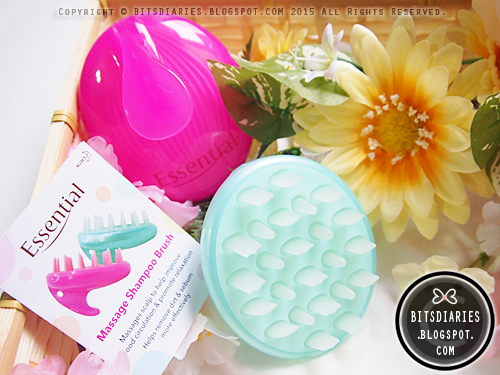 On top of that, I found the massage shampoo brush did help to reduce dandruff and promote healthier hair~! The results were very noticeable and I am very impressed with this Deep Cleansing Care variant and the brush! Heyyy~, you gotta try out this brush! It is one of the best beauty inventions in my view! 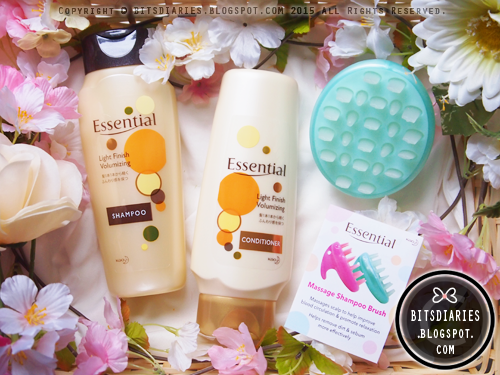 The Banded Pack, consists of Essential Shampoo 750ml + Conditioner 750ml with FREE Massage Shampoo Brush in hot pink or mint green, at all leading supermarkets at the price of SGD$19.60. FOLLOW Essential on Instagram @essentialsingapore for their latest updates! This article has been pretty much. It's got a lot of ideas. I hope the following advice to get a lot of benefit.I am going to try this one. I hope this will works better than other.